Use a tree (this one is from Paper Doll Dress Up) or other cut with a good solid base. You need stability so your cake topper doesn’t waver in its duty. And you need a cut with a fairly even cut across the bottom – if it doesn’t have it, you can always trim it. This tree is cut at 8″ tall. I used Cricut Craft Room to make the cut a little narrower in order to get two trees from one piece of 12″ paper. The width of the tree is 7.2″. After you cut your base image, wire your cut to attach pennants or letters later. For the cake topper, I used floral wire for the top branches and trimmed a bamboo skewer to have a means of inserting the topper in the cake. Note: bamboo skewers are not inconsequential so make sure your cut is wide enough to account for the added circumference. I used painters tape to hold my wires and skewer in place before adding the next layer on top. I used three layers – two for heavier weight papers for the base and one decorative patterned paper. 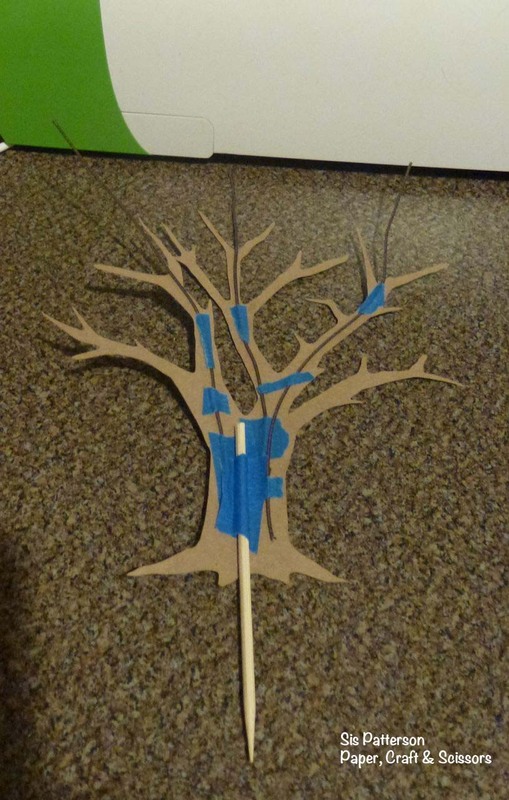 After assembling the base layers, I simply pinched the tree inward around the skewer to get a little added dimension. The owl is from Campin’ Critters and is 3″ tall. Her spyglass has a Glossy Accents lens with a hand cut heart. 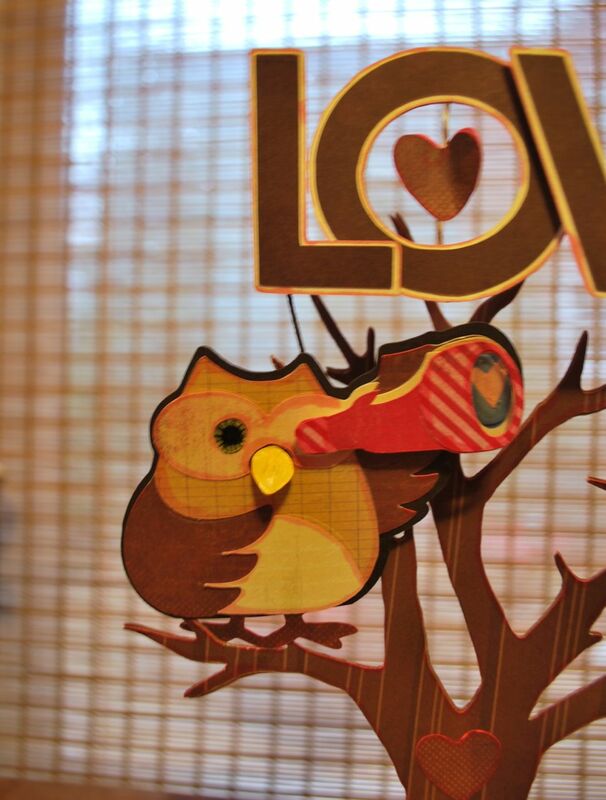 The word LOVE is from the Cricut Craft Room Basics. You may have noticed there were three wires in the construction photo, I simply trimmed the unused wire but I have learned it is better to have it and trim it than not have it when you need it. Here’s a close up of the owl with her spyglass. I hope you enjoyed your visit and have visions of cake toppers dancing in your head now. For those so inclined to leave a comment, you will be entered in a random drawing for a $25.00 gift certificate to Papertrey Ink. One entry per person please, and the drawing will close at 8:00 PM EST on Sunday January 29. Don’t forget to hop on over to Doreen’s blog from some more inspiration and I hope you’ll come see me again soon. Yummy looking cake. Love the decoration. Simply delicious. Such a creative way to decorate your cake, I love it and that cake looks fabulous! Very cute cake, and CHOCOLATE ! It looks great ! I love the cake topper! And the owl is too cute! Thanks for Sharing! Love your cake topper. I think alot of people forget about all of the other images on Paper Doll Cress Up and I just love seeing them used. Your Love Tree and owl are fabulous! And let’s not forget the cake, which looks so incredibly yummy! What a fun cake topper! This is just too cute! OH wow! This looks like something from the most upscale bakery. The ribbon gives it “posh” quality for sure! Perfect color choices to work with the frosting. Imaginative and fun and always well-constructed, your projects are always magazine quality. You should send an email link to Curt Jensen for the most delicious use of Campin Critters! adorable cake topper!!! perfect for Valentines Day. How cute you should start a bakery. Thank you for sharing with us. I like Nadia’s idea…I’d definitely vote for you in a “most yummy” contest. 😉 As I opened this post this morning, a light bulb went on in my head and burned the crafting cob webs away. I recently lost a bet with my brother in law and have to make him a cake. I think it would be hilarious to deliver it with some sort of cricut statement on it. Now, I’m going to have to put my thinking cap on. Your cake frosting skills are fabulous. I love the strip of paper/ribbon (?) you added around the cake too. I am amazed it is on so straight and is staying there. You have a lot of greenery left in your yard. Looks gorgeous back there! This is so adorable. I love the little cake topper. Nice job. That is just so sweet. What a way to really add some pretty elements to a pretty cake. MMMM Great job. Thanks for sharing. Very classy and sophisticated looking. I love how this looks, and I want Campin Critters so bad! AND… Its 9 am and I want cake! Love your cake topper! I’m a new follower. Love love love the owl on your cake topper. Such a cute little spy on top of a gorgeous chocolate cake. I love the idea of using a paper cake toppr! Thanks for sharing. I love this project, super cute, love the spy glass. This is AWESOME!! And that cake looks YUMMY! What! That tree is amazing! Yummy!!! The decorations are great!! This is a sweet fun idea! I will absolutely be trying this out! Love the design, thanks for sharing such a clever idea! This is an amazing cake! So cute and delicious looking! 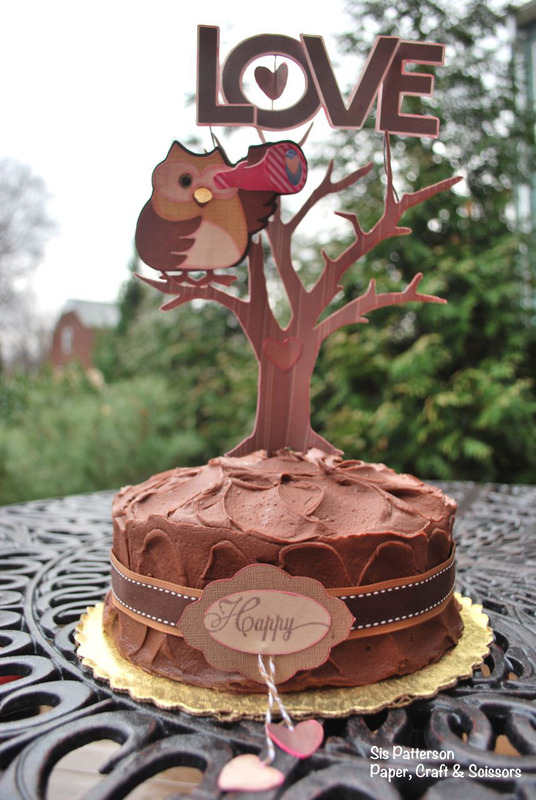 Adorable cake topper and the cake has me craving some chocolate on a cold Saturday morning! I just “love” your cake topper. Such a great idea to personalize a cake. Thanks for all of the great tips with the wire and bamboo stick – I’ll have to try making one of these this year. Love the topper and your cake looks delicious! I love the owl holding the telescope!! What a great idea having the Owl looking for love. Awesome cake topper! Very cute cake topper the cake even looks good. To bad I cant eat any but anyways thanks for sharing. The cake looks so yummy. Thanks for sharing. That cakes looks delicious. I love the topper it looks perfect with the cake. Thank you for sharing! Love this idea!! Love it!!! And yes, cake toppers are definitly dancing in my head…..
Thats is pretty incredible!!! looks yummy too. Awesome project! I love the owl, the tree and especially your “LOVE” with the heart in the O! Thanks for sharing your tricks for making this a reality! Owl always remember your project! Oh my that looks sooooo delicious but too pretty to eat. You did awesome! that is so adorable ! Thank you for sharing! Wow, how did you place all the parts and keep the cake perfect. So cute. Great project! Good tips too. Very cute idea! And it looks delicious too. Your cake is dreamy!! YUM! Love the owl in the tree and what a fantastic job you did!! Love it! This cake looks fabulous! I may do something like this for my BIL’s 50th but add the vulture from “Life’s a Party”. Thanks for the great inspiration. What a beautiful cake topper and the cake looks scrumptious! !